Conventional Mortgage: This is where you have 20% or more of the purchase price to put down by the time you take possession (the down payment). This is the best deal for buyers. Insured Mortgage: Here you have at least 5% to put down, but not 20%. You need repayment insurance for this kind of mortgage and so it costs a little more. Non-Resident Mortgage: This is where the buyer is not a Canadian nor a landed immigrant. In this case you will likely need to put at least 40% down to get a mortgage. From the time you enter into a contract to buy your suite until your first 5 year mortgage term is over, well over 5 years will have passed. We suggest you obtain financing for a 5 year fixed term at the time you buy to protect yourself from rate changes for that 5 year period. 5 year mortgages are also easier to obtain than other mortgages for a number of reasons. 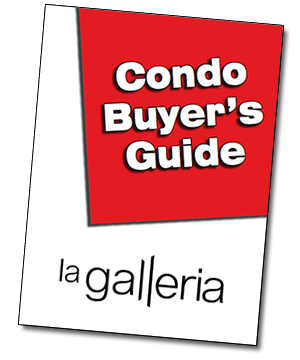 To get the lowest rate, buyers sometimes obtain a variable rate mortgage. These can offer an even lower rate, but leave you vulnerable to rate increases if the Canadian prime rate goes up. Most mortgage lenders will pay for your appraisal costs and may contribute to your legal costs as a gift to you for using them, make sure you ask about this. Most buyers arrange a mortgage at the time they sign the Contract and get an offer letter from a bank or credit union, we can help with this. Many buyers start with a 25 year mortgage to keep payments low, and then change it to a 15 or 20 year mortgage after 5 years when they can afford larger payments. You need to show income to qualify for a mortgage, unless you put at least 50% down. Other debt will reduce how much you can borrow, such as vehicles purchased on credit. For a very rough estimate of how big a mortgage you can qualify for, take your total household annual income before deductions (you and your spouse/partner) and multiply by five. For example if your household income before deductions is $60,000 then you likely qualify for a mortgage of about $300,000. If you have trouble qualifying for a mortgage many people ask a relative or close friend to co-sign the mortgage, which means they agree to pay if you don’t! Also, if your down-payment is 20% or more of the price, many mortgage rules can be flexible. Make sure you use the price including the net GST when you are dealing with the bank so you do not need to provide the GST money when you take possession. Many mortgage companies want you to buy life insurance for your mortgage, this is optional. Most mortgage companies charge double the price for life insurance compared with what you can get on term life insurance from a life insurance company, bought separately and not tied to a mortgage. We recommend that if you want life insurance to pay off your mortgage if you die, simply buy a term life insurance policy not tied to any mortgage.